This year and counting ! Play darts, join a cribbage team or shoot some pool. Music and sports by satellite. Check out the most recent tournament winners on our Tournament Results Page. Click on the links, Lots of information about Horseshoes. In operation since 1978, the H.H.P.C. 170 Brockley Drive in Hamilton Ontario, with six indoor artificial clay courts and four outdoor sand courts.Tournaments take place year round with the majority being in the winter months. Our regular visitors include a group of American friends who also enjoy pitching indoors during the cold weather. League play is on Tuesday and Thursday mornings and evenings and sanctioned tournaments and fun events are scheduled for the weekends. As well, our club has a number of regular social activites, annual dinners and dances. L.L.B.O. New members are welcome. Try playing horseshoes three Tuesday nights free before you join as a member. It's great exercise and lots of fun too! See you on the Pits?? NEW' We have horseshoes on Sundays now 11 A. M.
Next Euchre Night, Friday April 26th. at 7pm. Check out our History Page? 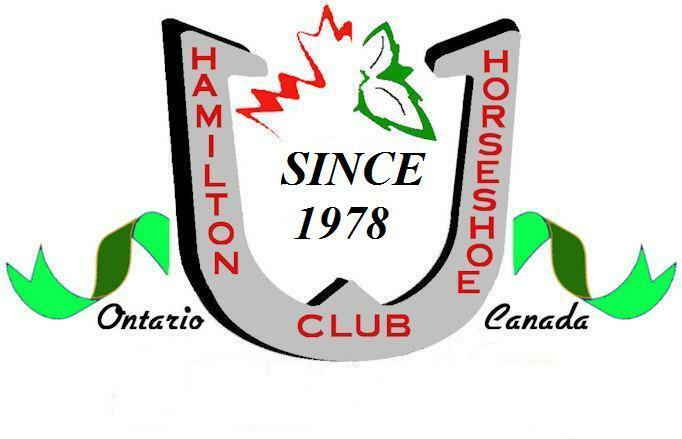 I am happy to announce that the Executive of the Hamilton Horseshoe Pitching Club has passed a motion to lower the dues for Nov. 1, 2014 to October 31, 2015 to $100.00 (plus HST). 1. Able to practise anytime there is no function being held. 2. Able to join the Thursday Night League. 3. Able to play Tuesday evenings and Tuesday and Thursday mornings. 4. Able to participate in the many other functions being held at the club such as progressive euchre, texas hold-em, darts, fun nights, dances, etc. 5. Guaranteed entry into any sanctioned tournament . Schedule Tournements link for dates. Please help us spread the word about this change in dues. We ask that you consider joining the Thursday Night League play that will run from Oct. to May . Feel free also to check out our new and improved website - hhpc.bravehost.com and hit save in your favourites so you can check in anytime, or email us at home@hamiltonhorseshoe.com.